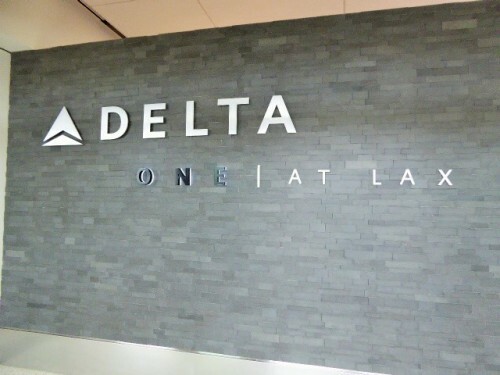 Delta Air Lines opened a private check-in lounge at Los Angeles International Airport Terminal 5 this week, capping off a 3-year, $229 million terminal wide refurbishment project. Here are some snaps of the lounge that I took while covering the event for USA TODAY. Priority is good, Delta One offers services above that. This is the first of a series of private check-in lounges Delta Air Lines plans to open at major hubs. Paparazzi be-gone. Private check-in door means celebs don’t mingle with others in the public lobby. The walnut wall that surrounds the seating area offers privacy, yet lets in natural light. A nice touch. A bit hard to tell from this photo, but that check-in desk is made from the tail of a DC-9 airplane.. By MotoArt.